In specific cases you may need to load data in the RadDataGrid when the control is already displayed as this can improve the performance and save computing resources. Loading a large data set on a mobile device has its challenges. One of the most popular approaches is using incremental data loading in the moment the items need to be visualized. Automatic: The load-on-demand mechanism is activated when you scroll down near the last item present in the view port. You can control when the items will start loading more precisely by setting the LoadOnDemandBufferItemsCount property. It indicates at what point the additional items will start loading. For example, setting it to 20 will cause the new items to be loaded when you have scrolled the RadDataGrid so that only 20 of the originally loaded items are left below. Manual: A "Load More" button is present at the bottom of the RadDataGrid. Clicking it will load additional items based on the approach you have chosen for loading the items(through the event, the command or the collection). Eventually, you need to add this custom command to the Commands collection of the RadDataGrid. Invoking the ShowLoadOnDemandLoadingIndicator and HideLoadOnDemandLoadingIndicators is a noteable part as without calling these methods the BusyIndicator used for the functionality will not be visualized. Besides the different approaches for loading the data, RadDataGrid exposes several mechanisms related to the styling of the functionality which you can use according to the approach you have chosen. Setting this property will modify the appearance of the load on demand indicator when the LoadOnDemandMode is Automatic. 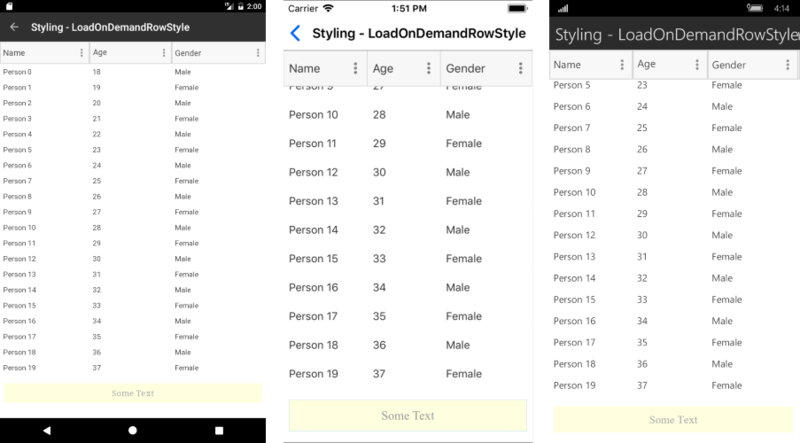 This property can be used to style the appearance of the row that contains the "Load More" button when the LoadOnDemandMode is Manual. 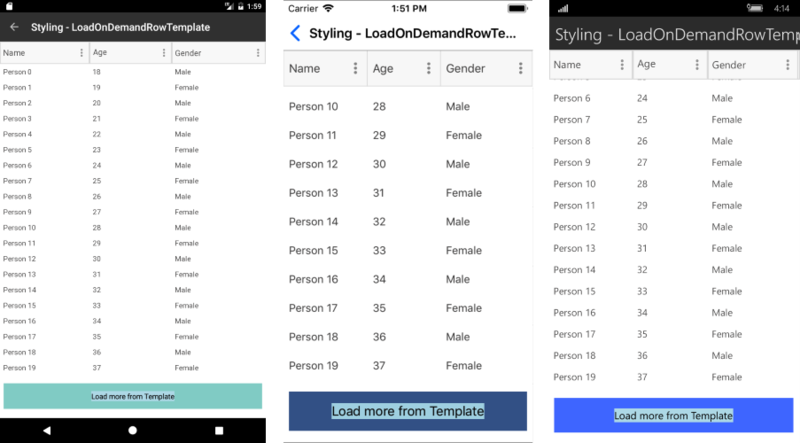 This property can be used to set the template of the row that contains the "Load More" button when the LoadOnDemandMode is Manual. <Label Text="Load more from Template"